In less than two weeks, previews for Lorwyn will begin in earnest (to take nothing away from our planeswalker rollout—definitely worth a look if you haven't checked it out yet). The talk of new sets is always the most exciting time of year, the big set that comes out each fall being the most exciting because it takes us to a new place from the standpoint of flavor and gameplay mechanics. Lorwyn will not disappoint on either front. But with each new block entering the Standard environments, we have to say goodbye to some things. The stuff that is leaving is often overshadowed (and rightfully so) by the new stuff coming in. But the outgoing deserves one last moment in the sun, so to that end I'm dedicating this article to a whole bunch of things worthy of saying goodbye to. The September 1st Banned and Restricted List announcement will be going up tonight if it isn't up already, and the biggest news therein is that the card Shahrazad will be outright banned in both Vintage and Legacy as of the 20th. No, I am not joking. Prior to this change, the only cards banned in Vintage are those that just don't work within the confines of how tournaments are played—ante cards and dexterity cards. The former, like Rebirth and Demonic Attorney, are a relic of how the game used to be played, a way of putting something on the line in the days before Organized Play was a big part of Magic. The latter, like Chaos Orb and Falling Star, make the amount of table space any particular game has access to relevant, and that isn't the kind of thing that tournament organizers can afford to alter significantly. Additionally, the rules for what is and isn't allowed when using one of these cards are hazy, and the "one foot" thing can be difficult to properly enforce. Along similar lines, the Organized Play department requested that Shahrazad be banned from tournament play for logistical reasons—it requires more time than can be allowed to play out. Not only does the card make you and your opponent play an entire "subgame" of Magic within the original game, but it also requires you to set aside the original game intact so that it can be returned to at a later time—a process that uses both time and space, resources valuable to tournament organizers and quantum physicians alike. Because of how much time Shahrazad can eat up, the card is ripe for abuse. The worst-case scenario involves a player winning the first game of a match and then sideboarding in some number of Shahrazads, launching subgames nested within subgames, each with copious and meticulous shuffling until time runs out. Or, faced with losing the first game or the match, a player could use a card like Burning Wish to fetch up a Shahrazad and attempt to stall the match into a draw right there. This behavior takes advantage of the structure of tournaments in a way that is both unfair and against the spirit of the game, so I have no problem endorsing the banning of the card. The questionable loophole involving Shahrazad and suspend was closed in the Tenth Edition comprehensive rules update, so I have a hard time imagining any real strategic value to playing the card other than as a pure time-wasting device; to that end I don't think we're taking anything away from the "Eternal" formats by not allowing the card. And if you enjoy playing the card casually, feel free to do so. Consider the list of cards banned in Vintage to now include ante cards, dexterity cards, and subgame cards. Simple. File this one away under the Sundering Titan / Rude Awakening precedent—Flash wins too many games of Prismatic too quickly, so we banned it. Now that Classic is a tournament format in Magic Online, the DCI has to start maintaining it. The big decision was whether to have a banned list, like Legacy, or a restricted list, like Vintage. We settled on being more like Vintage than Legacy because philosophically, Vintage and Classic perform similar roles, even if the power level of Classic's decks is more in line with Legacy. Classic is the last bastion of playability online—if a card were to be banned there, it wouldn't be legal in any of the traditional 4-of-limit, 60-card-deck formats, which is not something we want to happen. So we're going with a restricted list and we're starting small—just Vampiric Tutor and Flash. Time will tell if more stuff needs to be added. For the first time in a long while, some of the Magic Online Vanguard avatars are undergoing some changes. You can view the list of changes here. I'll always have a place in my heart for the Ravnica block—not only is it a great mix of fun and flavor, but I consider it a big turning point in my career here, the sets where I really came into my own as a designer and developer. Angel of Despair – I typically shy away from rehashing popular old cards as a design technique (Time Spiral notwithstanding), but Vindicate + big Angel seemed like such a great recipe for a card. Belltower Sphinx – Printed exactly as submitted. I love that it can turn your opponent's attacks against him. Bottled Cloister – I was trying to make an interesting risk-versus-reward card drawer. Circu, Dimir Lobotomist – Another big hit with the casual crowd, so much so that we use the term "Circu" around the office now to describe a card that is a casual home run without ever showing up in high-level tournaments. Civic Wayfinder – I've always been a sucker for simple creatures with comes-into-play abilities, and Ravnica is full of such cards. The Wayfinder has a functionality that I couldn't believe hadn't been done to that point. Cloudstone Curio – I've heard many, many casual "Johnnies" talk about their Cloudstone Curio decks. Coiling Oracle – Another card printed as it was submitted. It comes with a little moment of suspense... do you want a land or a spell? Followed Footsteps – Most designers have a soft spot for "copy" effects. This one is my best entry into that category. Giant Solifuge – Admittedly I didn't design it as a hybrid card, but whatever color it was I knew it would be hell on control decks. My kind of creature. Grand Arbiter Augustin IV – I went back and forth with the development team with this card trying to find the perfect implementation of the flavor I wanted. This was try number four, and it worked out great. Grave-Shell Scarab – We were a little scared of printing this card because it seemed unstoppable. I'm glad we went through with it. Hatching Plans – So many people cried out that this was useless, and then lo and behold it starts showing up in Standard decklists. I'm glad creativity isn't dead. Life from the Loam – Lead developer Brian Schneider wanted the set to have some dredge cards that made use of an inevitably full graveyard. This was the most interesting of the bunch. Mark of Eviction – There's a fine line between annoying-but-entertaining and annoying-but-ruinous. I felt this card was the former; some co-workers believed it to be the latter. Protean Hulk – I made this card initially in Fifth Dawn design. We knew it would be broken somewhere, but no one could prove it. Quicken – I "made" this card in a development meeting based on a much more convoluted design that was trying to do something in a similar vein. I really enjoyed the hype that this card generated without actually being all that strong. Rise // Fall – I didn't make the Fall half—Mark Rosewater did. But I made Rise and I knitted the two together. My favorite of the Dissension splits. Silhana Starfletcher – Something about a green creature that is both an "Elf" and a "Spider" really tickled me. Simic Sky Swallower – Big and dumb. Sometimes you need to be blunt. Sisters of Stone Death – I love little more than top-down design. A trio of Gorgon Sisters? You got it! One ability per sister! Skeletal Vampire – This was almost cut from the set until we saw that casual players around the company enjoyed the card. Thoughtpicker Witch – A great little "griefer" card. Everything Lurking Informant wished he could be. Trygon Predator – Before design was even over, Dissension lead developer Matt Place asked me to include a cheap creature that would be good against Umezawa's Jitte. This is what I came up with, and it saw print... and play. Watchwolf – ...if you can call this "design." Cool card in any event. And now, in the interest of fairness, I'll list my 25 favorite Ravnica block cards designed by someone other than myself. Azorius Chancery – I mean the "Karoo" lands in general. We sat around a table for hours trying to come up with the perfect common land cycle, and I believe it was Paul Barclay that came up with these. And to think, many players initially said they "aren't worth the loss of tempo" in Limited. Bramble Elemental – A great cookie for playing with Auras. Chord of Calling – A terrific use of convoke, and a great way to enable a toolbox-style deck. Dark Confidant – Another great risk-versus-reward card drawer, "Bob" has altered deck design in every format. Doubling Season – The casual home run of all home runs. Who doesn't like having twice as much stuff? Of course, this card's success has Rosewater trying to double everything in the game. 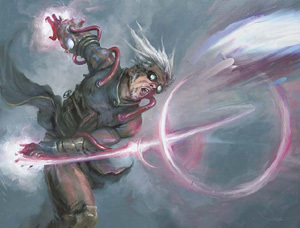 Galvanic Arc – The Garfield-created "CIP" Auras were one of the defining features of Ravnica Limited. Ghost Council of Orzhova – Massive, cheap, and terrifying. The perfect Orzhov leaders. Ghostway – There has been much arguing over whether this card is actually good, but one thing's for sure: it's a heck of a lot of fun. Hunted Dragon – Another Garfield special, the flavor and gameplay of the Dragon being chased by Knights works perfectly. I wish the other four were this evocative. Izzet Guildmage – This Guildmage spawned more decklists than any other. Lightning Helix – When Schneider suggested this, I thought he was joking. Niv-Mizzet, the Firemind – Another awesome top-down legend. One "super-smart Dragon," coming right up! Odds & Ends – Odds, by Mark Gottlieb, may be my favorite half-card of all time. Peel from Reality – This card, like Ghostway and Mark of Eviction and Cloudstone Curio, fuels my love of CIP creatures. A very unique "bounce" spell, which is hard to come by these days. Pillory of the Sleepless – The quintessential Orzhov card. Rumbling Slum – The quintessential Gruul card. His "drawback" is actually an advantage, and he enables bloodthirst like a champ. Searing Meditation – Maybe not the quintessential Boros card, but it is the quintessential red-white card. A great build-around. Shadow of Doubt – A cool line of text that can make for some jaw-dropping "Gotcha!" moments. Sparkmage Apprentice – I said I was a sucker for simple CIP effects; this guy is adorable. Sprouting Phytohydra – A card that does good work all by itself as a blocker and opens the door for all kinds of Johnny shenanigans. Sunforger – Designed by Devin Low as a top-down "Hammer of Thor." Another great deckbuilding card. Tolsimir Wolfblood – Perhaps my favorite card in all of Ravnica. I got your "Revive Pet" right here, buddy. Voidslime – It counters everything. How cool is that? Warp World – I have had more fun with this card than any other in the block, which says a lot. Wee Dragonauts – The quintessential Izzet card, with adorable creative elements thrown in to boot. Looking at those lists, wow, does Lorwyn have big shoes to fill. As that set's lead designer, though, I will say that it is up for the challenge! An industry stalwart, InQuest Gamer magazine is being discontinued after September. I understand that magazines have a tough time competing in an increasingly internet-savvy world, but still this saddens me. I always bought the magazine when I was a player, even while on the Pro Tour, and I enjoyed being interviewed by them as a Wizards employee. They always made Magic seem fun and exciting. Best wishes to Thorin McGee, Jeremy Smith, and the rest of the IQ gang in the future. Matt Cavotta is waiting outside with the engine running. Over the past years, my job duties have changed to the point where I am no longer the best person to write the Latest Developments column. For starters, the role of Director of Magic R&D has burdened me with enough responsibilities that I am at the office late most days. Mix in a family with two young daughters that are very demanding of Daddy's attention, and this column ends up being written between 11 p.m. and 3 a.m. a night or two before it goes live on the site. I just don't have the time to give it my best effort. On top of that, I'm not really just a developer any more and have to split my time between design, development, creative, and big-picture stuff, not to mention a ton of administrative nonsense. I'm not sitting out in "The Pit" anymore arguing about costs and metagames and draft picks. So I'm handing off the column to my successor as Head Developer, Devin Low, starting next week. I doubt you'll miss me. After all, aside from my three-part epic "How I Got Here" (Parts One, Two, and Three), I've tried not to make this column about me, but rather about the cards and the game. Anyone with in-depth knowledge of the material can do just a good a job as I've done, and Devin certainly fits that bill. I won't be invisible, that I promise you. I'm sure I'll be penning Feature Articles once in a while, and once Gleemax is up and running I plan on doing some blogging there, far from the structure and deadlines of a weekly column. Until then, I have a department to run. Are you more or less interested in following the Magic Invitational now that people like Evan Erwin and Stephen Menendian are included along with the top pros?